by Bill Dwight on Monday, November 15, 2010 at 6:48 PM | LEAVE A COMMENT! This week, our picks feature chore battle strategies, tips for parents with iPhone/iPad wielding kids, charitable project suggestions for the upcoming holidays, and a couple of bonus videos. Do you skirmish with your kids over chores? (If not, what’s your secret??!!) 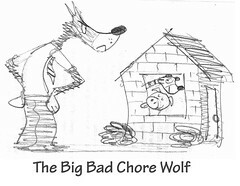 Sheila shares some excellent practical tips in her article on winning the chore battle. Do your kids access games or music using your iPhone or iPad? You’ll want to review this article before they rack up some unexpected bills. The [Insert-holiday-name-here] Jar is a neat idea for introducing youngsters to philanthropy in a tangible, hands-on way. Read Kelli’s article here, and get started now before you’re overwhelmed with holiday prep. Don’t miss the article’s comment section for some additional suggestions. You can find the remainder of the 10 part series here.